While it’s easy to get caught up by the passion and finger pointing in Tuesday night’s debate, it’s important to remember the real purpose of a presidential debate - educating and informing the American people. Mobile devices: our couch companionsAlready this election season, we’re seeing voters research issues, find information, and even register to vote across desktop, smartphone, tablet and television. This data reinforces the need for political campaigns to engage voters across all four screens - especially during key campaign events. With the portability of mobile devices, many people are using them while watching television to search for follow-up information or to fact-check. The debates were a great example of this mobile multi-tasking as people turned to their mobile devices in real time to find more information about the comments and issues raised by the candidates. Looking at a timeline of searches for a specific issue like energy throughout the debate, we can see that the spikes in searches occur in direct response to specific conversation sparks on television. Immediate informationIn addition to being used in front of the television, people turn to their mobile devices when they’re looking for immediate information. The “always-on” nature of tablets and “always with you” nature of smartphones make them quick and easy to pick up for a spontaneous search. 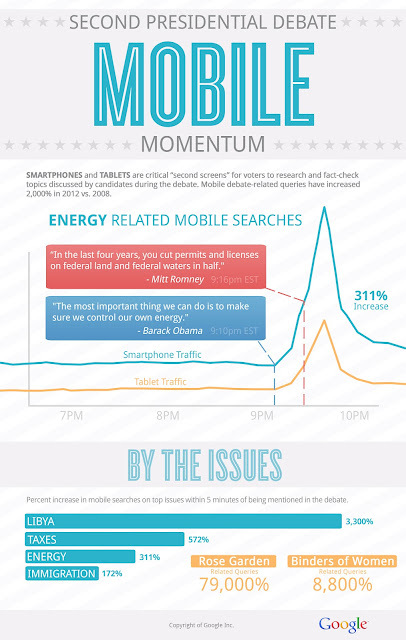 During the debate we saw enormous spikes in mobile queries immediately after panelist questions or statements from the candidates. For example, within one minute of Mary Fallano’s question to Romney about his tax plan, tax-related mobile searches increased by over 500%. This is true not just while watching the debates, but also throughout the day as people use their smartphones while talking about politics with friends, listening to the news, or even after coming across an offline ad. Four screens to victoryAs we enter the final weeks of the presidential election, digital devices will be key to helping voters decide which candidate is right for them. It’s a well-known fact that one of the keys to a successful candidacy is controlling the message. What’s clear in today’s multi-screen world, is that controlling the message on any issue requires that a candidate have a strategy to engage with voters across all four screens.